Mornings... love them or hate them, they happen every single day! My motto is to be as productive as possible during the early hours of the day. Working toward a goal sometimes can be grueling but this is how I manage my goals - physical, spiritual and emotional - all during the first few hours of my day! Hope this helps some of you work towards being a "real" adult, finish your first manuscript, read 52 books in a year... whatever your goals might be. It has surely helped me. 6:00 am: Rise up, early. (No need to be rushing when I can avoid it). 6:05 am: Brush teeth (yep, sounds obvious, but it's my way to actually wake up). 6:10 am: Stretch (to activate my body and brain). 6:25 am: Meditate while cooking. Reflect on my gratitudes, affirmations, and goals for the day. 6:35 am: Eat breakfast while READING. My favorite way to eat breakfast. My current read is Becoming by Michelle Obama. Talk about inspiration for future goals! 6:55 am: Walk to gym. I choose my attire depending on who I want to be or how I'm feeling. Weird, I'll admit it. But see how it works... Bee Leggings when I'm feeling like a busy bee, Queen of Hearts when I need a reminder that I rule and all black leggings when I'm feeling more serious. I could go on, because I have all the leggings from our store, but you catch my drift. 7:00 am: GYM time. Sometimes I'll read while I use the treadmill. Short stories or poetry books are perfect for this. 8:00 am: Bullet Journal to organize my day (find out what this awesome method is HERE) You can choose from any of our awesome pocket journals. My Feminist Agenda is my new favorite! 8:30 am: Start morning commute. While I drive, I visualize myself having a great day. 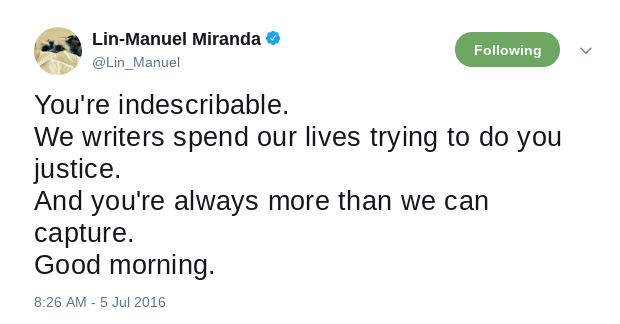 While I wait in traffic lights, I read Lin-Manuel Miranda's Twitter feed on my phone. Nothing like having a multiple award winner and creative master giving you a pep talk in the mornings. Have you got a hold of his new book with his little morning messages? If you haven't, you should. To say that its uplifting is an understatement. 8:45 am: Arrive at work. Choose a job that you love and you will never have to work a day in your life, as the saying goes. Well, that's it! As you can see, through meditation I check in with my emotional and spiritual health; through reading, I engage my mind; through exercise, I work on connecting with my body; through bullet journaling, I write about all of the above, all while focusing on my goals for the day. When I am very dedicated to my morning routine, I find myself feeling happier, enjoying the day more, and feeling more productive. Now the hard part is sticking to it. How do I do it? Here are some tips to help you stick to your morning routine (whatever it may be). Sleeping enough is VITAL to our wellbeing. If you are making these choices to improve yourself, then you also have to make a change to your sleeping pattern. At first, it can be hard to get started on a new habit but setting reminders and alarms on your devices can help you stay on track. Start with setting a short amount of time for new habits. For example, instead of going to the gym for 30 minutes, tell yourself you'll go for 10 minutes and then build up to the amount of time you want to dedicate to that particular habit. This will help you feel like it's a manageable feat. It takes around 3 weeks to create a habit, so stick with it for at least 30 days and you will be golden! Make a calendar and a checklist; check it twice if you have to but continue with this new routine and you will achieve your goals without feeling dread! Is your new morning routine centered around reading? Exercise? Meditation? All of the above or another entirely different focus? There is no wrong answer. Some days it might be tough to get up in the morning but remembering your motivation will help you keep focused on your WHY. Hope this helps some or all of you make some positive changes! Let us know how it goes at any of our SM accounts!